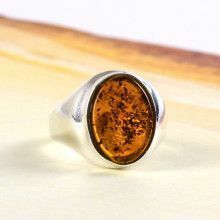 This modern ring was designed with a very beautiful and authentic chunk of Baltic Sea amber that is a honey-green hue. The organically shaped stone is approximately 1" long, 5/8" wide, and just over 1/2" thick. It sits in a thick border of sterling .925 silver and is further complimented with some angular silver accents. 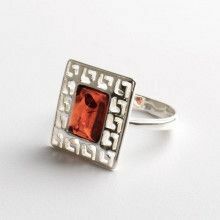 This hand-made, one-of-a-kind ring is available in size 8 3/4. Stone is about 1" x 5/8" x 1/4"